With this week's Disney World photo trivia post, I would like to remind you all, if you're having a tough day, to JUST KEEP SWIMMING! 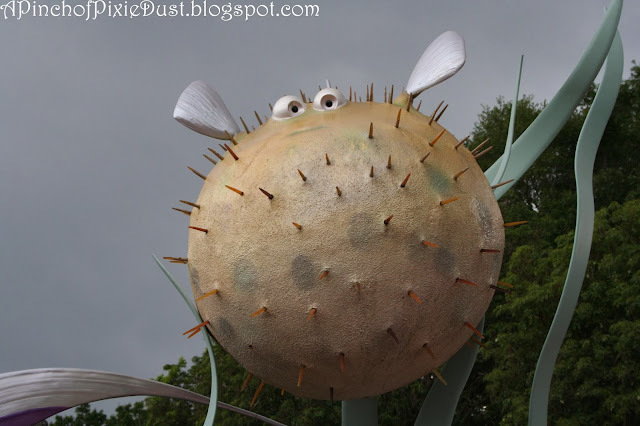 Looks like something's happened to upset Bloat, the pufferfish from Finding Nemo. Do you know where to find him so you can calm him down? Post your guess in the comments! Rachel got last week's trivia - those marching elephants can be found on one of the medallions on the floor of the Animal Kingdom Lodge! Yayyy! I get so excited when I actually get the answer correct, haha. Bloat is outside of The Seas with Nemo and Friends where they added more greenery to maybe prevent people from climbing all over when taking pictures? That's just my guess because the area looks different to me now. Disney Instagram Fun and December Challenge!